(Berlin, October 1, 1961). Corelli, Parutto, Barbieri, Bastianini, Ferrin; De Fabritiis; Chor. and Orch. of the Rome Opera. NAMED “BEST LIVE” OF ALL TROVATORE RECORDINGS — Gramophone, July 2013, THE GRAMOPHONE COLLECTION: The Troubled Troubador by Mike Ashman. “Live in Berlin, where a good time was had by all, and less well-known soprano Mirella Parutto is a star alongside a thrilling Corelli. This performance is very serious business. The singers feel their parts as if their lives depended on it. Franco is aflame (much more so than in the Salzburg Trovatore, with Karajan). He sings his scenes with Azucena with warmth, fervor and, in Act II, frenzy. His high notes are very brilliant. He may sing with a little more accuracy of intonation and control over dynamics when he is using mask placement, as in OL-6010, Il trovatore, but when he lowers his larynx, as he does in most of this Trovatore (OF5), he conveys more excitement. He does use mask placement in “L’onda de’ suoni mistici” (which comes after “Ah! sì, ben mio”) but otherwise, to use his expression, “floats” his larynx. In the recitative to “Ah! sì, ben mio” he has shifts of timbre resulting from covering and uncovering his tone, and in the aria itself he makes some random and misplaced accentuations. He also does some mellow singing without darkening as much as in Eracle. (The most compelling “Ah! sì, ben mio” is Björling’s, in tune and sensitively phrased, in #5000, Il trovatore, from The Royal Opera House, 1939.) In the “Pira” of OF5 Corelli sings with tremendous urgency in his tone. Despite his downward transposition of a half step and some inaccuracies of little consequence I know of no more exciting version. He is at his zenith both vocally and emotionally. In “Parlar non vuoi?” uttered with his larynx all the way down, his sings his most overwhelming “Intendo! Intendo!” No wonder Gramophone in its July 2013 edition proclaimed OF5 the “Best Live Trovatore!” The last quarter hour makes me tremble and weep every time. “Corelli’s fans will be satisfied with his viscerally thrilling interpretations of both Manrico and Cavaradossi [in Tosca, BCS #5013], but in the case of Trovatore the fact that we can hear five Italians in the major roles, virtually an impossibility today, is of even greater significance. It lends the performance an authenticity and flavour others simply cannot equal now, let alone surpass. Fabritiis is, as he always was, a splendid exponent of Verdi, energising the score from within. Apart from some distortion on the soprano’s louder notes, the sound is good. “The sound of the October 1, 1961 Berlin Trovatore by the forces of the Rome Opera is well-balanced, with ample warmth and clarity—-certainly clear enough to hear the prompter! Only the occasional, slight overload on the highest, loudest notes (usually female) keeps the recording from approaching the ideal. Bel Canto Society also retains a considerable amount of the audience’s enthusiastic response, further adding to the atmosphere of the occasion. “Corelli begins in magnificent voice, holding a B-flat in Manrico’s entrance for what seems an eternity. As with Björling, Corelli joins his Leonora for a high D-flat at the conclusion of the Act I trio (his far more secure than Parutto’s). The audience loves both of these thrilling liberties with Verdi’s score, as well as the interpolated high notes in ‘Di quella pira’, here taken down a half-step to B. But in the end it is the discipline and sensitivity aligned with these magnificent vocal gifts that make this Corelli Manrico so outstanding. Certainly there is the occasional sloppiness of rhythm, an aspirate instead of a true legato here and there. And of course as with most Manricos there are no trills in the great aria. But for the greater part of the Berlin/Rome Trovatore, Corelli seeks and attains the synthesis of bel canto elegance and romantic passion that is at the heart of this great opera. I find this performance the best of the Corelli Manricos I’ve heard, including a 1961 Met broadcast led by Fausto Cleva, a 1962 Salzburg performance under von Karajan (both with Leontyne Price) and the 1965 EMI studio recording with Gabriella Tucci, Thomas Schippers conducting. Corelli was at his best when performing not in a studio, but rather, before appreciative audiences. In the heat of the moment, he seemed less inhibited, and inclined to give more of himself. Perhaps this generosity was sometimes taken to excess but, as you’ll see in my review of a 1967 Parma Tosca,BCS #5013] you won’t hear any complaint from this writer. “Most impressive are Corelli’s scenes with Azucena, performed by the great Fedora Barbieri. At this stage of Barbieri’s career, the high notes did not come easily. In fact she completely ducks the B-flat toward the conclusion of her Act II narrative ‘Condotta ell’era in ceppi.’ But there is so much that is right about Barbieri’s Azucena—-the wonderful diction, the rich tone, the dramatic intensity that chillingly portray the character’s precarious mental state—-that any shortcomings pale within the greater context. “And Barbieri’s great performance seems to inspire Corelli to one of his most probing and sensitive interpretations. 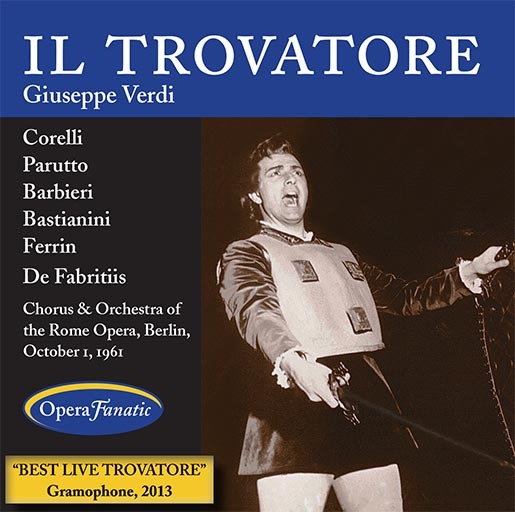 I recommend this Trovatore to those who believe that Franco Corelli was incapable of insight and subtlety. I’ll cite but one example of the superb interplay between these two wonderful artists. After Azucena has described the burning of her own child, Manrico cries, ‘I am not your son! And who am I’, Azucena insists that Manrico is her son and reminds him, ‘Haven’t I always been a tender mother to you?’ Verdi directs that Azucena sing this phrase ‘con passione,’ which Barbieri does, with a pleading in her voice that tugs at the heart. It certainly tugs at the heart of Corelli’s Manrico, who replies, ‘Can I deny it?’ in a breathtaking hushed and tender voice. Time and again, Barbieri and Corelli give us such unforgettable moments. “The performance begins well, with an excellent account of Ferrando’s narrative by Agostino Ferrin—-dramatically involved and attentive to the composer’s dictates. Not as impressive is Mirella Parutto’s rendition of Leonora’s opening scene. The recitative and start of the aria begin promisingly, with a convincing sense of Leonora’s desperation aligned to a lovely vocal quality. But as the aria progresses, the high notes become more precarious, and Parutto’s struggles continue in the ensuing cabaletta. Indeed throughout this Trovatore, Parutto’s inconsistency mars her performance. A valiant effort, but one that certainly pales beside other Leonoras in Corelli performances, such as Leontyne Price and Gabriella Tucci. “Ettore Bastianini’s well-documented di Luna has always inspired ambivalence on my part. I find the baritone’s vibrant, dark, and handsome vocal quality virtually ideal for the role. On the other hand, the lack of a true legato and the obvious effort in coping with di Luna’s high tessitura compromise Bastianini’s undeniable strengths. There is certainly much to enjoy in this virile and intense performance, but it lacks the refinement that is very much part of the Count’s music, if not his character. On February 13, 1960 Corelli and Barbieri were singing Trovatore at Naples’ San Carlo theater. After their second-act duet a man cried out that Barbieri should bow by herself: “Barbieri sola, sola! Brava lei!” [Brava to her.] Corelli ran offstage and upstairs to the perpetrator’s box and attacked him. They were separated. Afterwards Corelli wouldn’t speak to Barbieri. I asked him why. He wouldn’t tell me. We’ll probably never know what really happened. Barbieri was the one who had given Corelli his nickname, “Coscia d’oro”—Golden Thighs. Anyway, backstage at the October 1, 1961 Trovatore they didn’t speak. Click for an additional review, by John T. Hughes in Classic Record Collector. “If you want this performance in the best sound available at this time, get the BCS. You will be pleasantly surprised.”—-Nicholas E. Limansky, Opera News Click for full review.